Quarterly house price growth in Australia fell 2.4%QoQ in 4Q18, accelerating the decline from 3Q18 (-1.5%). 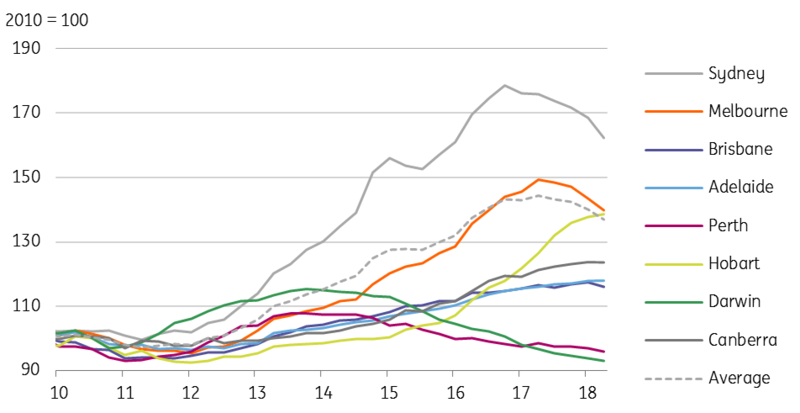 Although this still looks orderly, it does raise the prospect of a more disorderly decline and shifts the probability further in the direction of some RBA easing. The 2.4% QoQ decline in Australia's house price index is the fastest quarterly rate of decline in the history of this series, including the dip during the 2008/2009 financial crisis. Annual house prices are now falling at more than a 5% rate. While the rate of decline seems painful, this is still essentially a Sydney and Melbourne story, with much more moderate declines elsewhere, and some increases or stability in other centres. Of course, Sydney and Melbourne account for a very large chunk of the average index, so dominate the headline figures. But it isn't clear that this is a national issue requiring a national monetary response rather than a regional problem. We aren't forecasting any rate cuts form the RBA. Like them, we feel that the labour market remains one of the most important variables in considering any potential for rate action, and currently, there is no pressing need for a response in either direction. We might be more concerned about housing if we were to see further signs of weakness spilling through into consumer spending. The latest RBA minutes also seem to share this concern, pointing to the "considerable uncertainty" that surrounds the consumption outlook. 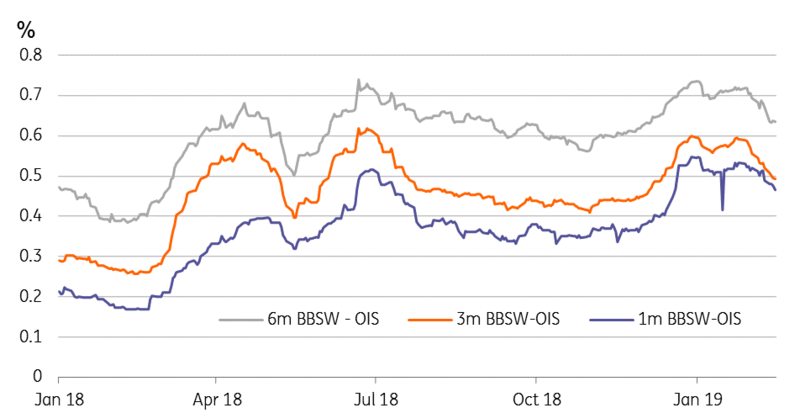 In the meantime, market rates have fallen substantially in the last three months, with bank bill swap spreads over the overnight index swap ( OIS - a proxy for the Reserve Bank cash rate) falling sharply. This might also lead to lower lending rates before too long, just as the rise at the end of 2018 led to some rates being increased without the RBA changing rates. We don't deny that the downside risks to our economic view of Australia have increased and that therefore the probability of some easing from the RBA have also risen. But for now, we maintain that unless we see confirmation of spillover weakness from housing to the labour market or a further capitulation of the consumer, then the market is doing most of the RBA's work for it, and they can hold pat. Until the twelfth of never….